If you are are a reader of this blog then the name Scosche is probably a familiar one to you. Back in December Scosche was the first to make a 2.5mm to lightning cable that allowed Bose listeners a more convenient way to pair their wired headsets with their new Apple products. Called the “Strikeline” it has gone one to be massively popular, partly because Bose is such a big market player and also because the Strikeline is just an awesome and affordable piece of engineering. Well, it would seem Scosche is not content simply providing cable upgrades of Bose users and have now released a pair of earbuds of their own that are out-of-the-box ready to connect to lightning-only iPhone 7/7+, iPads and as well as the upcoming iPhone 8. The name doesn’t exactly roll of the tongue, mostly likely because these were named by an engineer and not a marketing professional. 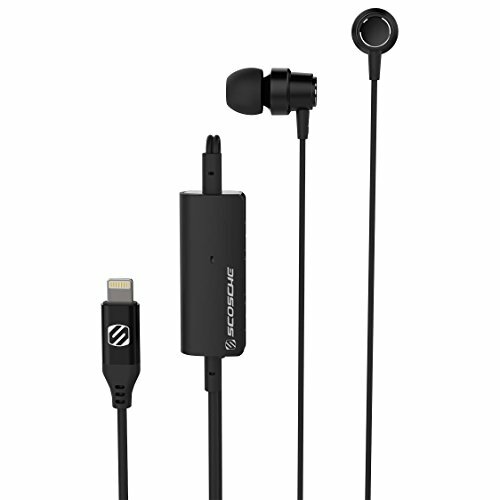 Called the “IDR300L”, or “Increased Dynamic Range Earbuds w/ Lightning Connector” these are Scosche’s first self-made lightning-cable earbuds. While this website applauds manufacturers that push the technological envelope with their designs, the IDR200Ls are a relatively conservative option for Apple users. There are no built-in amplifiers to up your audio quality, no active noise cancellation, no real “smart” features to speak of. Scosche does mention “Increased Dynamic Range” technology, but don’t say anything else about it.. leaving the user a bit confused as to whether this is real engineering or marketing lingo. There is no detail provided on the driver type or size on the products official specification page. It would be nice to know what IDR really entails..
What you do get are a pair of earbuds that plug directly into your Apple device and transmit the hi-res digital signal directly to your eardrums. You also get an in-line control and microphone for taking calls. There are also 3 little colored caps you can pop on and off the earbud driver unit itself to change the color up a bit. It would have been nice to see time and money put into taking advantage of the powered lightning connector rather than creating swappable little plastic caps, but hey, for some aesthetics are everything. Overall, there’s not much to get excited about here.. from the boring name to boring features list, there is not much to differentiate these from what is currently available on the market. On the plus, Scosche DOES have a solid reputation for producing quality electrical equipment. They are an American company and have been making electronics components, originally specializing in automotive products, since 1980. Compared to a lot of the other “fly-by-night” Chinese lightning headphone makers currently flooding the market with crap products, it is nice to have the piece of mind you are buying a quality set of earbuds that won’t fall apart on you within a month of use. The price point is pretty fair at just under $80 as listed on their official website. We do wonder though why anyone should pay $79.99 for the IDR200L when Scosche sells what looks to be a near identical lightning headset called the HPL1 for $59.99. While these earbuds won’t blow your mind, they may be a great option for someone looking for a pair of backup earbuds for travel or use at the gym.